Holistic Shop The first holistic shop for dogs, cats and horses in Czech Republic. Healthy foods, nutritional supplements, herbs, vitamins, minerals, nutritional consulting, online advisory service, articles, individual feeding programs for animals and more. For Holistic Shop´s Info and Product Website use this link. Troll Hunderfor Producers of norwegian dog food Troll and equipment for sled and hunting dogs. Webshop. Dogsled - Go Mush Many articles, reports and results from the most interesting world´s races, audio/video interviews, Alaska weather news, demos from booting up of dogs, harnessing, etc. Severske Listy Website and magazine covering just about everything from Nordic countries - great reading! 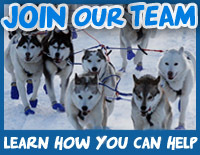 Health, Nutrition and Care of Sled Dogs. To see links to Recommended Literature, Publications and Videos, please click here. Return to "Home Page "